Every new and expectant mother has probably heard the term attachment parenting. It sounds exhausting, as all parenting surely is, but in practice, this method of parenting can help create securely attached, independent children. And, in case you’re confused, independent = less exhausting! Now, before people think we’re taking sides, let’s be clear: attachment parenting is not your only option for achieving this goal –we are firm believers in the fact that all parenting styles are legit ways of growing good humans. We’re just the messengers here, yo! Many argue that attachment parenting will result in bratty, overindulged, spoiled children. And, if done incorrectly, that line of thinking is surely a possibility. The difference between attachment parenting and just indulging your child is that, in attachment parenting, you are responding appropriately to your child’s needs. Meaning, their needs are reasonable as is your response. Your child needs food, you provide it. Your child needs comfort, you provide it. Your child needs you take him away from his overbearing grandmother whose perfume, loud voice, excessive kissing, and overzealous behavior is giving him a headache, you do that too. The attached parent works to meet a child’s needs in a reasonable and timely manner –not worrying about things like strict schedules hard, fast rules, or what grandma says. As a newborn, your child does not want for frivolous things. His wants align completely with his needs. He wants food, he wants comfort, he wants a fresh diaper, or quiet time. Those are also things your baby needs. Providing them allows your child to learn to trust you. It teaches him to feel cared for and safe which allows him to develop easily other traits, like braveness and inquisitiveness, that will help them become independent as they age. In order to make attachment parenting work for you and your child, you need to get to know your baby. Concentrated effort must be devoted to learning your baby’s cues, to understanding what his needs are and how he expresses those to you, and to tailoring your response to ensure you are meeting those needs appropriately. 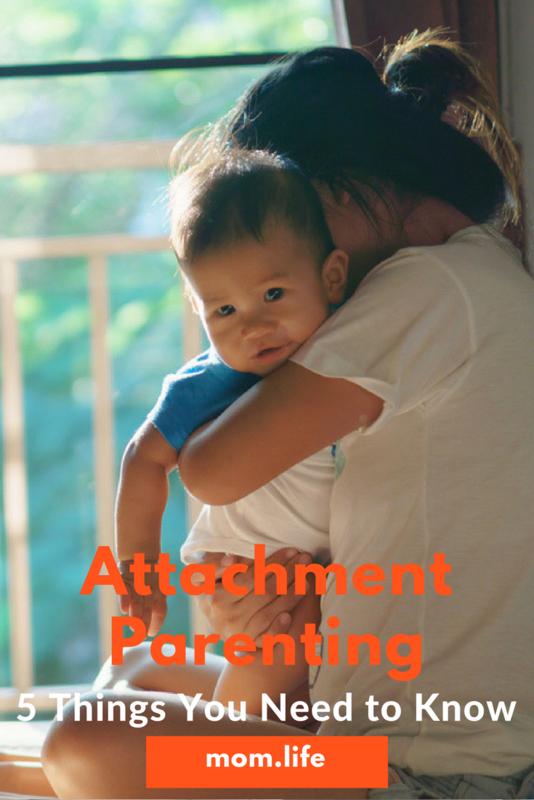 It doesn’t mean that you need to strictly monitor your baby –a lot of attachment parenting is about being spontaneous and flexible in your responses. It just means that it takes time! Communication is a struggle in every relationship, and the one you have with your baby is no different. They just can’t rule your life. Things like demand feeding and baby carrying often play a role in the life of an attached parent, because these practices allow you to respond to your baby’s needs appropriately. Demand feeding doesn’t fit neatly into a strict schedule, nor does baby carrying if you really think about it. Those who live that attached parenting life, understand that today you may be doing a lot of holding and comforting and you might not get your chores completely done, but tomorrow, because of your attention today, you will probably be more hands free! It is not a protective maneuver. Remember that your goal is to create a well-adjusted, independent child. Attached parents encourage exploration and bravery, they want their child to feel safe taking risks and learning new things. Attachment parenting supports this because it helps you to create a well-adjusted child who isn’t emotionally needy or fragile. They don’t perform attention seeking behaviors because they already have your attention. Children who experience successful attachment parenting feel safe and supported at all times so they are comfortable trying new things and living independently –they understand that they will be cared for if hurt, looked for if lost, and supported if needed. They don’t live in fear of being abandoned or alone, nor are they overly dependent on their parents. Parents can think of themselves as IT support. Your child will turn to you when a virus strikes, or they encounter some other system failure that they are ill equipped to handle alone. However, on a day-to-day basis, they will excel at completing tasks, creating projects, and doing all manner of great and exciting things with you in the background. Looking for other attachment parenting moms to connect with? Our mom.life app is a great place to find them! Read More: Baby not sleeping through the night? Learn why and how to fix it!